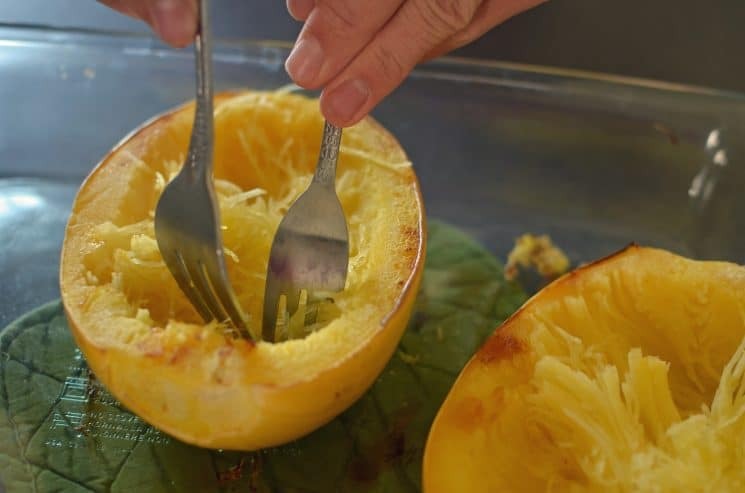 Check out our Ultimate Guide to Spaghetti Squash for TOP tips and tricks for cutting and cooking spaghetti squash that you can’t find anywhere else! And so many more we don’t even know about yet! 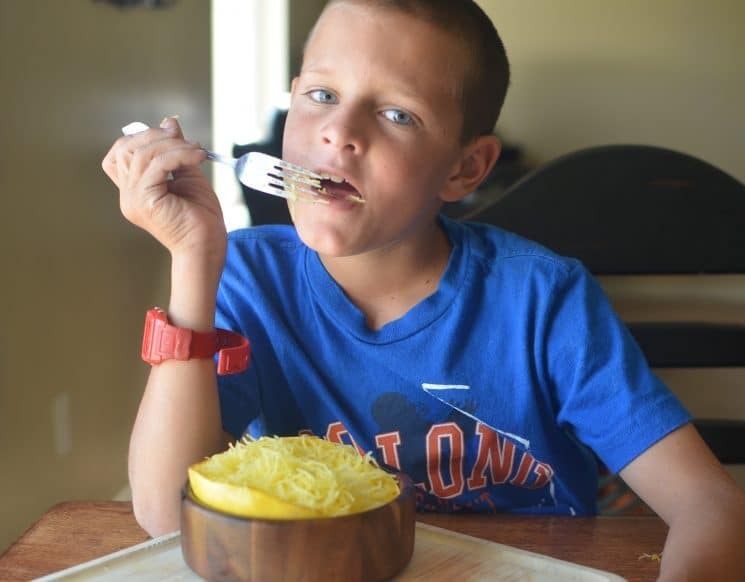 If you haven’t cooked some spaghetti squash with your kids yet, don’t wait any longer! They’ll have fun scraping the flesh out of the squash and watching it get stringy- just like spaghetti! That is exactly what we do when we are looking for simple side dish that goes beyond rice or potatoes. To prepare for our Spaghetti Squash Recipe, there are basically two steps. 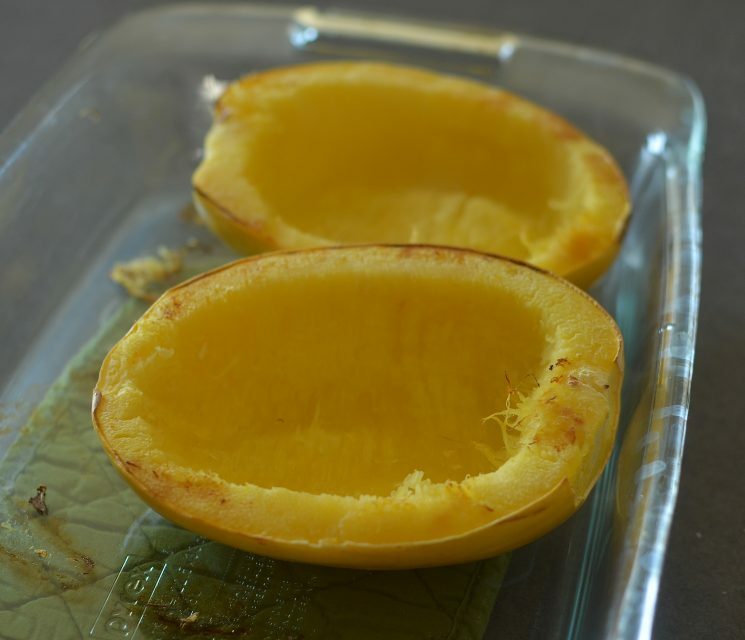 Cut your spaghetti squash in half and place in a baking dish. Bake at 400 degrees for about 30 minutes. Remove from oven. Using a fork, begin to scrape the flesh away from the skin. Once all the flesh is scraped, stir in some butter, Parmesan cheese, and salt. And Waaa-la! The perfect side dish! Have you tried it yet? We prepare the spaghetti squash like this, and then we can make a variety of dishes. Some of our favorites include, adding spaghetti sauce. Adding butter and parmesan cheese. A casserole like this Spaghetti Squash Bake or stuffed like a lasagna! 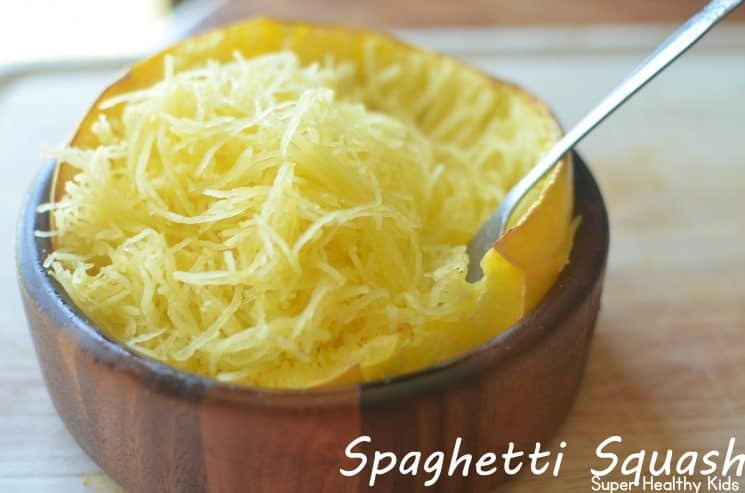 What other things do you like to include with your spaghetti squash? For more ideas to include fruits and vegetables at every meal, check out our meal planning service! We’ve got ideas for breakfast, lunch, snack, and dinner. It includes the recipe, nutrition data, shopping list, and weekly tips on getting the meals on the table. The meal plans are customizable by removing a meal and replacing it with another one from our database of over 3000 recipes! Check it out here. You won’t be disappointed! After I scooped it out of the squash, I sauté the spaghetti with a little bit of infused basil olive oil, minced garlic, diced onion & tomatoes and sometimes mushrooms. Add some salt and pepper. I cut some mozzarella in cubes (not a lot) and add them at the end as I give it a little toss. Mmmm so good! Spaghetti Squash is the best. We prefer it over actual spaghetti! I have made spaghetti squash a couple times and it seems crunchy. Is that its natural texture or am I not cooking it long enough? Michelle- We like it with a slight crunch (kind of al dente). But if you want it softer, rather than cooking it longer, try cooking it in an oven safe dish that allows you to add some water to the bottom of the dish. Per my mom, I always spoke it a few times with a knife and boil it whole until the skin is pierced easily with a knife. Great! Thanks, I will try it. I’ve made spaghetti squash a number of times but it always seems to turn out extra watery. For example, I used it as a substitute for pasta and the marinara sauce was extra watery. Any suggestions how how to get rid of some of that extra moisture? That actually has never happened to me Katie- If anything, mine gets too dry. Maybe bake yours upside down, so all the moisture ends up draining out instead?? I have tossed it with some spinach, artichokes, mozzarella, parmesean cheese and onion. Then broil it until bubbly. Its so good!! One helpful tip that I have found is to ask a worker in the produce section to cut it in half for you. So much easier because it can be a challenge to cut at home. Easiest way….cut in half and lay cut side down in glass cake pan with an inch of water. Put in microwave for 14 minutes, remove and cover with a towel for 5-10 mins. Then shred away! I put mine into a cheese cloth and squeeze and drain out liquid. I make baked spaghetti with mine. I layer it with spaghetti sauce, cheese, veggies (mushrooms, onions, peppers), and either chicken or pepperoni. It’s really easy and keeps well in the freezer. 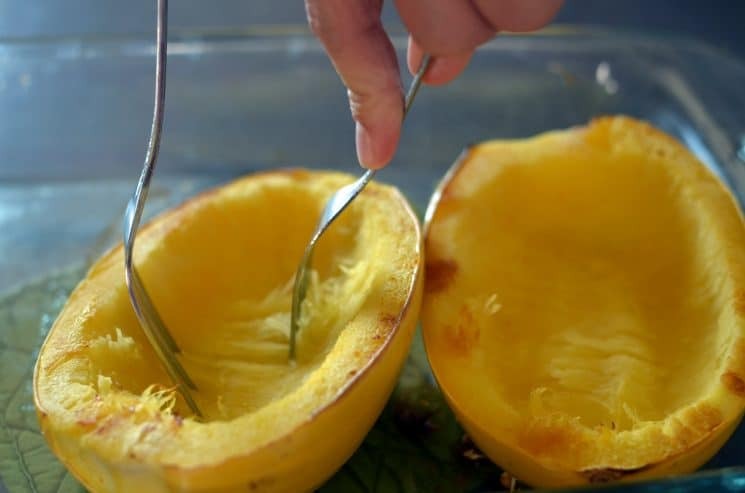 I cut in half, clean out the middle, spray just a tad of EVOO and add a little water into the well of the squash – cover with plastic wrap and pop in the micro for about 8 minutes to 12 minutes depending on it’s size. Much quicker for those trying to get dinner on the table quickly after work and before homework…. When you don’t have time to roast or slow cookit…….halve and seed it….flesh side down in a micro safe dish with a little water….microwave on high 10-12 mins. Allergen-free and tasty? Sounds great! Thanks for sharing this quick recipe perfect for a chilly fall/winter night! I use this squash many ways, mainly I cook the squash, shred it, and I either make stuffed peppers or buy frozen, Stuffed peppers and sauce over spaghetti squash, parm. cheese, sometimes toasted bread crumbs… This vegetable is very versatile.